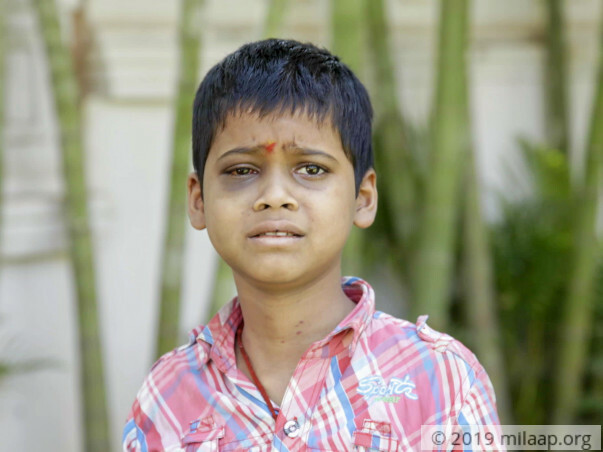 Sharat recently had bleeding in his brain, which has made his right eye completely red. He is scared to even look at himself in the mirror now. 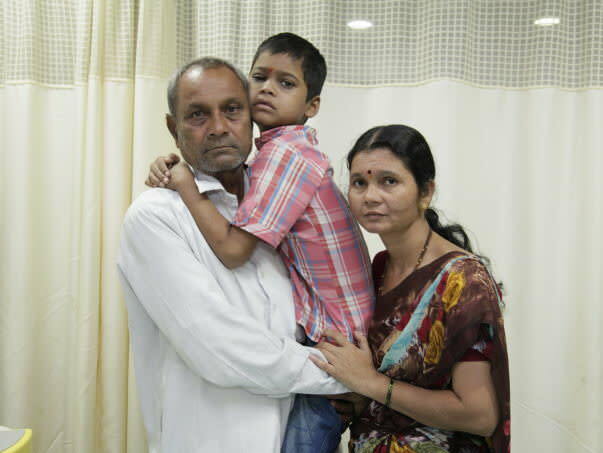 What his mother, Kaveri, thought was just a fever, is actually a rare and fatal blood disorder. Sharat has been taking blood transfusions every 20 days for 6 months, but he’s now clinging to life. 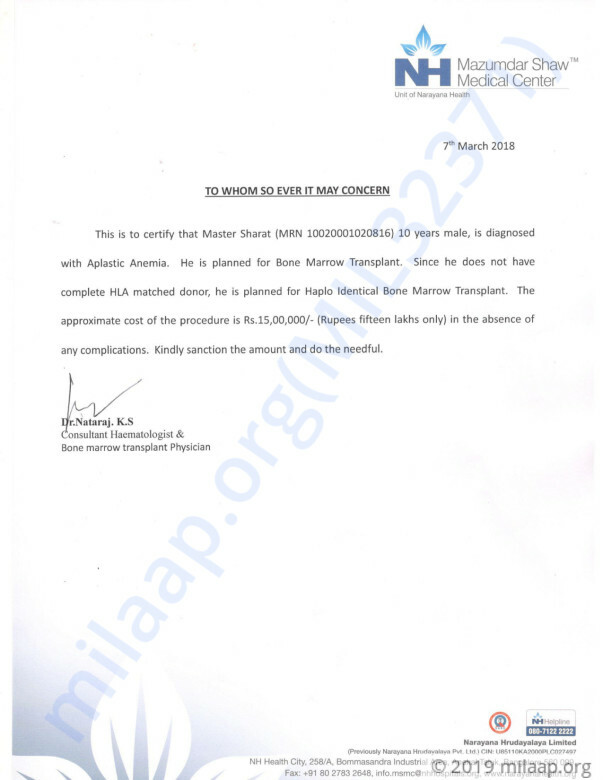 Only a bone marrow transplant can completely cure him. Sharat has aplastic anemia, a condition in which his body doesn’t produce enough new blood cells. People with low platelet counts tend to bruise and bleed easily, and the bleeding is often hard to stop. Nosebleeds, bleeding from the ears and gums have been a part of Sharat’s life for 6 long months now. Every day is a battle for him and Kaveri is distraught watching her son suffer so much. The only thing keeping him going are blood transfusions, but now, even that is not enough to keep him alive. Kaveri is a daily-wage worker and doesn’t earn enough to support Sharat’s treatment. Work is irregular and with Sharat's regular hospital visits, she can't go to work often. No matter how much she tries, Kaveri just doesn’t have the means to go on anymore. With help from her father, she was able to continue his transfusions till now, but Kaveri is at a dead end. Sharat is only 10-years-old and this blood disorder is making his condition worse each day. Sharat can stop living a life of pain and suffering with a bone marrow transplant. It can save his life, but Kaveri doesn’t have the means to afford it. She earns a meagre income and all her savings have gone in his treatment for the past 6 months. 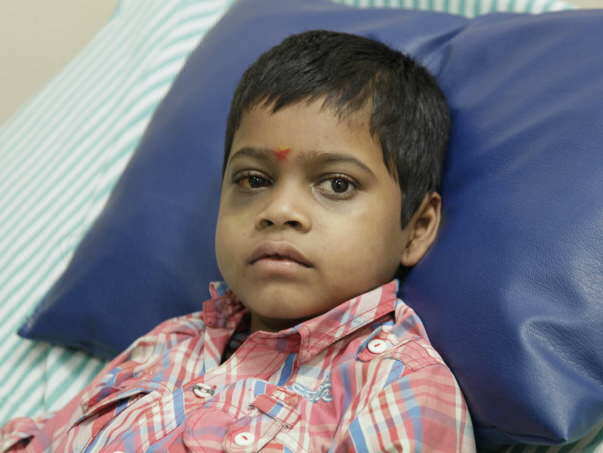 You can help Sharat get the treatment he needs and save his life. Your support will save Sharat’s life. Here is an update on Sharath's health. Sharath is currently at his home and doing fine. He is responding well to the treatment. He is on regular medication and he has to visit the hospital once in 10 days for blood transfusion. He will have to undergo a few tests so that doctors can schedule as when can the bone marrow transplant be performed.